This is an advertisement for Harris’ perambulators. For thousands of years babies were carried in slings or papooses and were carried on their mother’s backs but in 1730 a baby carriage was made for the children of the Duke Of Devonshire. It was beautifully made and included 2 small lamps on the front, it was even drawn by a small animal usually a dog. Others took up the idea and by the 1840s there were more affordable models on the market. Strictly speaking the perambulator is the person pushing the carriage because the word originates from the Latin words 'per’ and 'ambulo’ that mean to walk through, over or about. 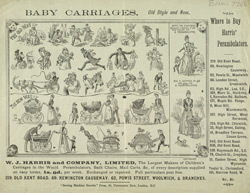 The word was soon shortened to pram which we still use today.